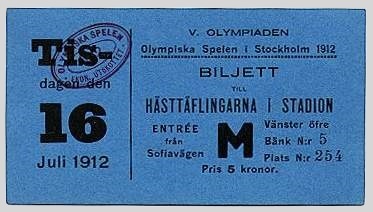 Entrance to the Stadium was obtained either by series-tickets, which were sold at the office at Norrmalmstorg; by day-tickets, as they were termed, which could be had at the turnstiles N:os 7 -12 and 21-28 at the Stadium, or else on payment of the necessary sum at the turnstiles N.os 1 -4, 13 - 20 and 29 - 32. There were 32 turnstiles in all, 2 at the entrance, to each section of seats. One ticket seller and one controller were stationed at each turnstile, there thus being 64 such officials. The Section for the booking of seats, which began its work as early as November, 1911, in the offices of the Central Association, moved on the 1 February, 1912, to 4 Norrmalmstorg, where, until the 15 August of the same year, it occupied a flat of 9 rooms, some of which, however, served as offices for the Reception Committee, the Accommodation Committee, the Inquiry Office, etc. 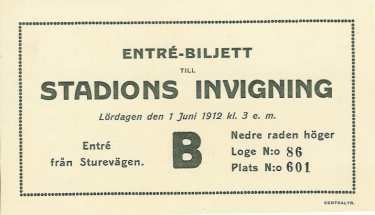 The preparatory work for the sale ot tickets, which, amongst other things, included a very lively early booking of tickets, was carried out at the offices of the Central Association, under the direction of Mrs. Dagmar Waldner, who had two assistants. After Mrs. Waldner had transferred her services to the Reception Committee, Mr. Carl Smith was chosen on the 1 February, 1912, as the director ot the section for the booking of tickets. He was assisted by Mr. N. Wennerstrom, as cashier, and a staif of 6 other persons, in addition to a porter. During the period when the Games were going on, however, the number of the staff had to be doubled. Mr. Julius Hoglund acted as controller of the cash-department. The sale ot series-tickets to the general public commenced on the 18 February, 1912, the hours between 11 a. m. and 1.30 p. m. being reserved for the issue of tickets previously booked, while the hours between 2 p.m. and 4 p. m. were devoted to the sale ot fresh tickets. 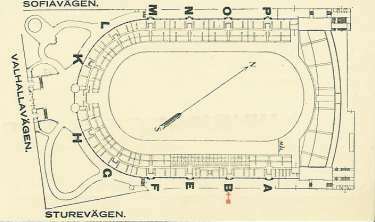 In order to make it as easy as possible for intending purchasers ot tickets to choose their seats, there was placed in one ot the rooms at Norrmalmstorg a plaster model of the Stadium, drawn accurately to scale, in addition to which, plans of the various sections of the reserved seats could be seen, all necessary information being supplied by members of the staff. The stream of purchasers proved to be quite as large as had been expected, and there was a very lively demand for seats the whole of the time. Until the Games began, only series-tickets were sold, the prices being £2.15.6, £4.3.0, £5.10.9 and £ 11 . 1 . for Stadium seats; £1.2.0, £1.12.9 and £ 2 . 15 . 6 tor series-tickets to the Swimming Stadium; 11 for the Fencing Competitions, and £1.7.9 for series-tickets for the Lawn Tennis and Football Competitions. In addition to these, there were also sold single day-tickets or the Horse Riding Competitions on the 16 and 17 July, which cost 5 sh. 6 d., 10/- and £ r.2.2 each, according to the position of the seats. The demand for tickets for the Stadium, especially, was very great, and the sections of seats first offered for sale were soon all disposed of, fresh sections having then to be offered to the public, although care was taken to reserve the necessary numbers of seats for sale on each day of the Games. The ratio between the above-mentioned reserved seats sold at the various prices proved to be a very good one, the number of tickets disposed of in each class being proportionally the same. Carl Hellberg, Esq., was appointed director of the Finance Office at the Stadium. The preparatory work here consisted of the drawing up of the forms necessary for exercising control over the business done and for statistical purposes. These forms proved to answer their purpose, a fact confirmed by the report sent in by the scrutineer of the figures. Messrs. H. Juhlin and E. Svensson were chosen to assist Mr. Hellberg in his work. Six lady-assistants, were appointed tor the purpose of counting the money received from the sale of day-tickets at the Stadium and of seeing that it was correct. The finance-office in queston was opened on the 1 June, 1912, when the great try outs began at the Stadium, the general rehearsal thus obtained being of the very greatest use,not only for the office but also for the attendants etc. The Finance Office was opened officially for the Games on the 26 June, and was closed at midnight on the 20 July. The work began as a rule, at 7 a. m. and finished at midnight, with intervals for meals. Full accounts were kept of all the monies received at the Stadium, as well as complete statistics of the number of persons admitted at the different turnstiles, to each ot the various groups of competitions. The sale of day-tickets tor the Stadium took place each day immediately before the competitions began, in order to avoid speculation, and also that there should be tickets available at almost the very last moment lor sightseers arriving by train or boat. The day-tickets were of two kinds, one, numbered, to a total of about 3,000, which were to be had at the ticket-selling offices at Norrmalmstorg, and the other unnumbered, there being some 10,000 tickets in this class, which, under the direction of Mr. Carl Hellberg, were sold at the turnstiles admitting to the Stadium. Perfectly satisfactory measures were taken to hinder the purchase of day-tickets for the purpose ol speculating in them, and the most perfect order was always observed by the purchasing public, in spite of the fact that, on those days when very interesting events were to come off, queues were often formed, each numbering several thousand persons. The prices of the day-tickets was from 1 krona to 25 kronor (circa, 1 sh. 1 1/2 d., to £ 1. 7.9: 27 c.-$ 6.70). The sale and distribution of the official Stadium-programme was confided to the Section for the sale of tickets, which received valuable assistance from the Stockholm boy-scout corps. It should also be mentioned that the sale of a very large proportion of the tickets for the various entertainments given in connection with the Games, was also in the hands of the Section mentioned above. It is clear, however, that the sale of tickets could not take place exclusively in Stockholm, and considerable numbers of tickets were sold and sent by post, to every part ot the world. Prospectuses with the prices of the tickets and plans of the seats in the Stadium were printed in the languages of most civilized countries, so that the public abroad could easily make suitable arrangements for the purchase of series-tickets for the Glames. The Committee for Finance was also commissioned to undertake the presentation of complimentary tickets to honoratiores, guests from abroad, etc., both for the solemn opening of the Games and for the whole of the competitions.